I’m not sure what’s more difficult to take: sitting on your back with your nose pointed up at the sky, or straight down at the ground. Actually, it doesn’t make much of a difference as we trudge our way through the handling course carved onto the back acreage of the grand Biltmore Estate in Asheville, N.C.
To answer a question you might be ready to ask, the Pilot is the Honda division’s version of the Acura MDX, which has been one of the hottest utes on the market since its launch two years ago. But the Pilot doesn’t just get a new name. There’s not a single panel of sheetmetal, nor a single pane of glass, shared with the up-market Acura model. The interior is completely different, as well. For one thing, Honda’s version is an eight-seater, one more than the MDX. And while the automaker might not like to make the comparison, the Pilot is designed, in many ways, to function as a stylish substitute for the far less hip Honda Odyssey minivan. Under the skin, there are other changes in line with Pilot’s primary purpose as a people carrier. The ride is a bit softer, the emphasis on comfort, rather than performance. The new SUV looks the part. Like most Honda’s the approach is conservative. Certainly nothing like the direction Isuzu has gone with vehicles like the VehiCross. 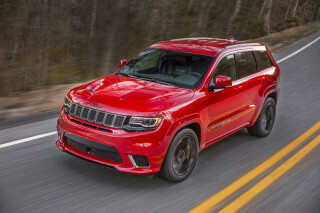 You’d be hard-pressed to find a Pilot in a lot full of sport-utes, nonetheless, it’s rugged in appearance, without overloading the design with lots of gray cladding. This is a sport-ute you’d feel comfortable driving on-road or off, to a campground or to a society soiree. 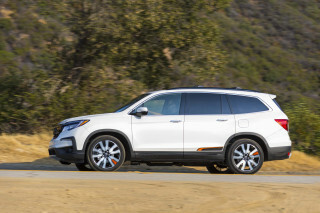 In pulling together this MDX spin-off, however, Honda designers and engineers worked from the inside out, the opposite of their approach on the Acura. That underscores its role as a rugged minivan alternative. The Pilot’s seating is arranged in a stadium-style 2-3-3 configuration, with relatively easy access to a third-row bench that’s primarily designed for kids. Indeed, there’s even an “activity tray” for kids designed to hold juice boxes, store toys and use their coloring books on a long trip. The operative word in the design strategy was “stuff,” both in noun and verb forms. There’s even a special holder in the center console specifically designed for cell phones. And it works well with virtually every shape and size, as we discovered trying out a variety of hand phones. 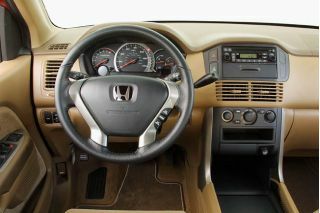 As you’d expect from a Honda, interior fit and finish is precise and well executed, with tasteful use of metal accents and, if you go for the upscale package, leather. 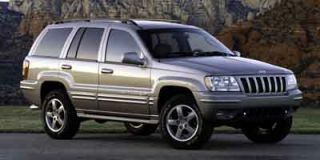 Even the base LX model is well equipped, though the EX offers several options travelers might be delighted to order. There’s a novel DVD navigation system that works both on-road and off. Hit trails that aren’t on the map, and the system will display electronic breadcrumbs to help you find your way back. 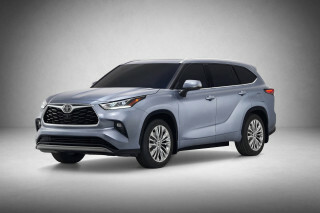 Unfortunately, you can’t order both the nav and DVD video system on the same vehicle, which means many buyers are going to opt for an aftermarket package to keep their kids entertained on long trips. You might question the utility value of some SUVs that barely offer enough cargo space to carry a suitcase. With all eight seats filled, there’s a modest amount of luggage space, but fold down the Pilot’s second and third rows, and you’ll get a cavernous 90.3 cubic feet of room. 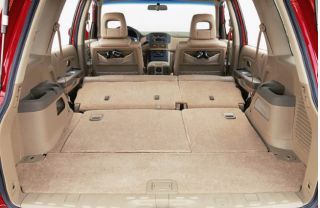 The new SUV is about 4.5 inches wider than the typical mid-size ute, such as the Ford Explorer, and that makes it easy to lay flat a sheet of 4x8 plywood. For those who intend to tow, the SUV can pull a 3500-pound trailer, 4500 pounds of boat. 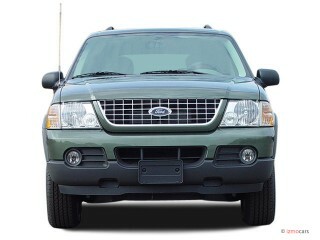 That’s not best in class—Ford’s Explorer pulls 5550 lb—but quite functional. 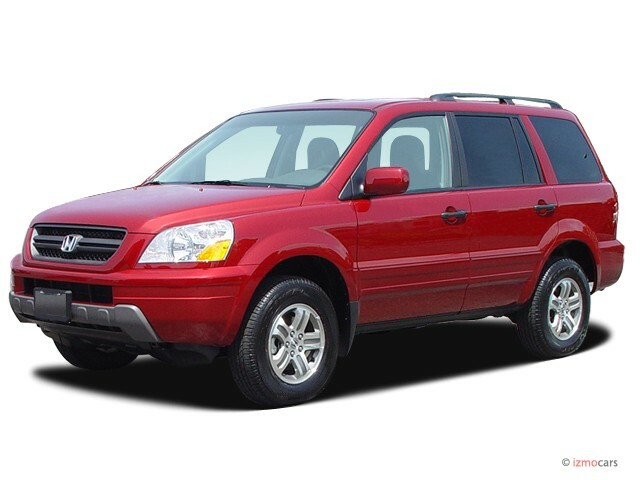 Power comes from Honda’s road-tested, 3.5-liter V-6, the same one used in the Odyssey and the MDX. It makes a solid 240 horsepower and 245 lb-ft of torque. 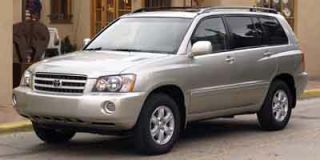 The engine is mated to a smooth-shifting five-speed automatic. One of our few serious complaints with the Pilot concerns not the transmission itself, but the odd placement of the shift lever. To provide more useful space with the center console, it’s column-mounted. That’d be fine, but the lever is positioned unexpectedly low, where it’s awkward to operate. We found ourselves repeatedly missing the intended gear and, when operating in 1st or 2nd, bumping the lever with our right knee. During a day of driving, we had plenty of opportunities to test out all the gears. On road, the Pilot has a softer and more comfortable ride than MDX, reflecting the intended market. A double floating subframe minimizes engine noise and vibration. In keeping with market trends and the type of buyer Honda intends to attract, the Pilot is expected to win a double five-star crash rating. There are dual-speed front airbags, and side airbags, as well. All eight seats get shoulder harnesses and headrests. 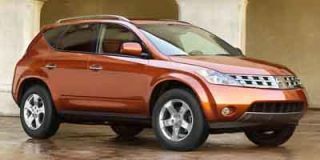 Safety advocates will be pleased to know that Honda also considered the issue of car-truck compatibility, the question of what happens when a 4600-pound, tall-standing SUV slams into a small car. A special “compatibility bracket” puts the first point of contact at the same level as a passenger car’s bumper. Pilot’s electronically controlled four-wheel-drive system doesn’t read on paper like the most technically sophisticated package. But spend time on some serious trails and you’ll have to think again. It’s critical to note that the off-road course we drove on was carved into the Biltmore grounds by Honda, but there’s no denying the nimble manner of the Pilot, which stood up solidly against several competitive vehicles. 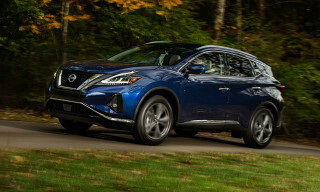 The 4WD system, by the way, operates in front-drive mode on dry pavement, but can automatically shift up to 55 percent of its torque to the rear wheels. There’s also a center diff-lock mode for especially treacherous conditions. 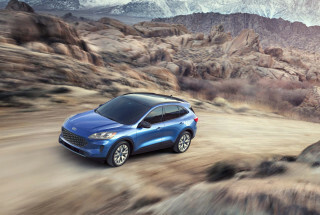 The Pilot offers eight inches of ground clearance and can ford up to 19 inches of water. Often slow and even plodding in its decision-making, Honda took plenty of time to finally commit to the SUV market. But it had no choice, with an estimated 70,000 owners a year abandoning the brand for other makes offering light trucks. 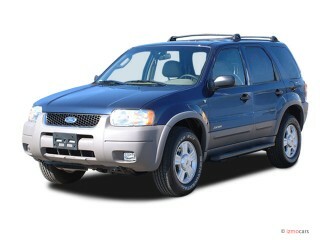 This is a solid, rugged and passenger-friendly vehicle at an unusually attractive price. At the very least, it’s likely to halt that exodus. For Honda’s competitors, especially those from Detroit, it’s a good thing production will be limited to about 80,000 annually. Otherwise, it might lead to an exodus in the other direction.